A huge congratulations to Sarah T. from Nova Scotia, Canada for winning last week's New Release Spotlight giveaway! Sarah chose Two Can Keep a Secret by Karen McManus as her prize. Remember that the NRS giveaway is open internationally, so if you live outside the USA, you are welcome to enter, too! Scroll to the bottom of this week's Spotlight to enter this week's drawing. How boring and bland is January? This week at school is so typical that I could practically do it in my sleep. We are in the middle of a four-week in-between period between Winter Break and our two-week Chinese New Year break. Next week, we'll start our super-popular "Blind Date with a Book," so I'm hoping the paper bags I ordered will arrive today. The display is all ready to go, but this time, I'm going to try wrapping the books with paper bags instead of old Scholastic catalogs. I encourage my students create Blind Dates for the display (not just from me! ), and many students had a hard time with the wrapping part last year. I'm hoping they will like using paper bags better. I'll write more about Blind Date with a Book in this week's New Product Thursday, so stay tuned if you want details! 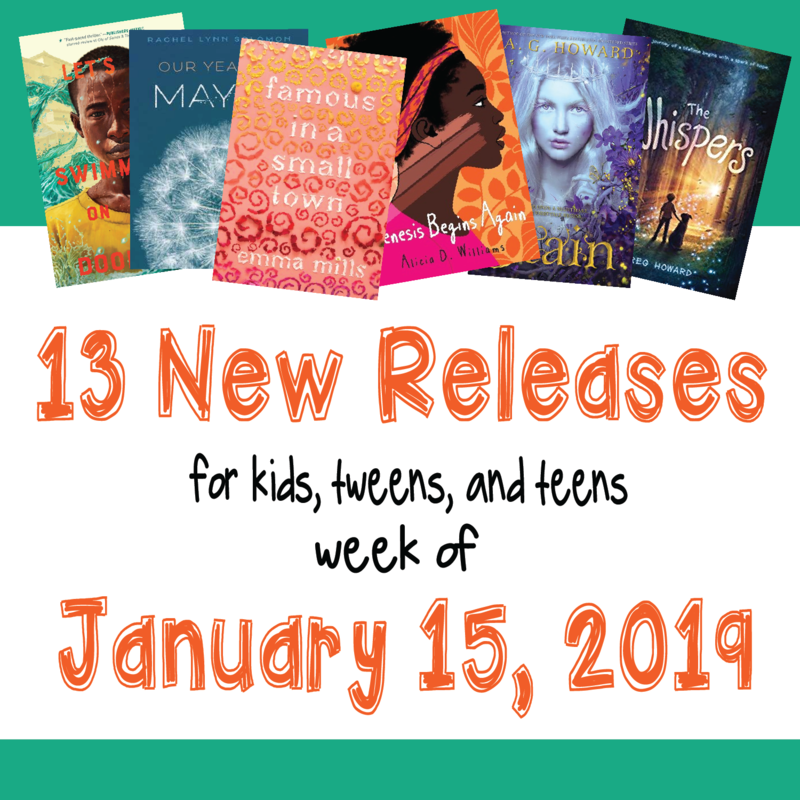 This week, I've found thirteen titles worth a look for your libraries. It's not as exciting as last week's list, but there are still several "purpled" titles that received two or more starred reviews. I will be adding Genesis Begins Again, 96 Words for Love, The Gilded Wolves, and Stain to my next book order. I also think Echo North will do well with my Shiver fans. After Lyra--a princess incapable of speech or sound--is cast out of her kingdom of daylight by her wicked aunt, a witch saves her life, steals her memories, and raises her in an enchanted forest . . . disguised as a boy known only as Stain. Meanwhile, in Lyra's rival kingdom, the prince of thorns and night is dying, and the only way for him to break his curse is to wed the princess of daylight--for she is his true equal. At a whopping 519 pages, this is a standalone novel, no series. Aspiring choreographer Sophie Orenstein, eighteen, wonders if seventeen-year-old Peter Rosenthal-Porter, gifted pianist, best friend, and secret crush, will love her back after receiving her kidney. But Peter's life post-transplant isn't what either of them expected. Though he once had feelings for Sophie, too, he's now drawn to Chase, the guitarist in a band that happens to be looking for a keyboardist. When Abdi's family is kidnapped, he's forced to do the unthinkable: become a child soldier with the ruthless jihadi group Al Shabaab. In order to save the lives of those he loves, and earn their freedom, Abdi agrees to be embedded as a spy within the militia's ranks and to send dispatches on their plans to the Americans. The jihadists trust Abdi immediately because his older brother, Dahir, is already one of them, protege to General Idris, aka the Butcher. If Abdi's duplicity is discovered, he will be killed. The Gilded Wolves, book 1. Paris, 1889: In this city, no one keeps tabs on secrets better than treasure-hunter and wealthy hotelier, Severin Montagnet-Alarie. But when the all-powerful society, the Order of Babel, seeks him out for help, Severin is offered a treasure that he never imagined: his true inheritance. To find the ancient artifact the Order seeks, Severin will need help from a band of experts. Together, they'll have to use their wits and knowledge to hunt the artifact through the dark and glittering heart of Paris. For Sophie, small town life has never felt small. With her four best friends--loving, infuriating, and all she could ever ask for--she can weather any storm. But when Sophie's beloved Acadia High School marching band is selected to march in the upcoming Rose Parade, it's her job to get them all the way to LA. Her plan? To persuade country singer Megan Pleasant, their Midwestern town's only claim to fame, to come back to Acadia to headline a fundraising festival. The only problem is that Megan has very publicly sworn never to return. Echo's carefully structured world falls apart after her father leaves for the city and mysteriously disappears. Believing he is lost forever, Echo is shocked to find him half-frozen in the winter forest six months later, guarded by a strange talking wolf-the same creature who attacked her as a child. The wolf presents Echo with an offer: for her to come and live with him for a year. But there is more to the wolf than Echo realizes, including a history she can't remember. A modern retelling of the classic Indian legend of Shakuntala and Dushyanta. Ever since her acceptance to UCLA, 17-year-old Raya Liston has been quietly freaking out. She feels simultaneously lost and trapped by a future already mapped out for her. Then her beloved grandmother dies, and Raya jumps at the chance to spend her last free summer at the ashram in India where her grandmother met and fell in love with her grandfather. Raya hopes to find her center and her true path. But she didn't expect to fall in love... with a country of beautiful contradictions, her fiercely loyal cousin, a local girl with a passion for reading, and a boy who teaches her that in Sanskrit, there are 96 different ways to say the word "love." Debut author! Eleven-year-old Riley believes in the whispers, magical fairies that will grant you wishes if you leave them tributes. Riley has a lot of wishes. He wishes bullies at school would stop picking on him. He wishes Dylan, his 8th grade crush, liked him, and Riley wishes he would stop wetting the bed. But most of all, Riley wishes for his mom to come back home. She disappeared a few months ago, and Riley is determined to crack the case. There are ninety-six things Genesis hates about herself. She knows the exact number because she keeps a list. Like #95: Because her skin is so dark, people call her charcoal and eggplant--even her own family. And #61: Because her family is always being put out of their house, belongings laid out on the sidewalk for the world to see. When your dad is a gambling addict and loses the rent money every month, eviction is a regular occurrence. Thirteen-year-old Min comes from a long line of fox spirits, but you'd never know it by looking at her. To keep the family safe, Min's mother insists that none of them use any fox-magic, such as Charm or shape-shifting. They must appear human at all times. Min feels hemmed in by the household rules and resents the endless chores, the cousins who crowd her, and the aunties who judge her. She would like nothing more than to escape Jinju, her neglected, dust-ridden, and impoverished planet. She's counting the days until she can follow her older brother, Jun, into the Space Forces and see more of the Thousand Worlds. This could be a good way to introduce persuasive writing. The chickens on the farm have a message for their farm owners! They're tired of arugula salad, how about putting a fan in their hot coop, and HEY--watch out for that snake in your tent. As the children walk around their beloved farm, they discover more and more chicken talk scratched into the dirt. The family can hardly believe it. What will the chickens possibly say next!? Your page is especially interesting to new librarians. One of my teacher mentors told me about it last semester! As always so many books and so little time. I am looking forward to reading some of these titles over Spring Break. Thanks for the reviews, always helpful!!! 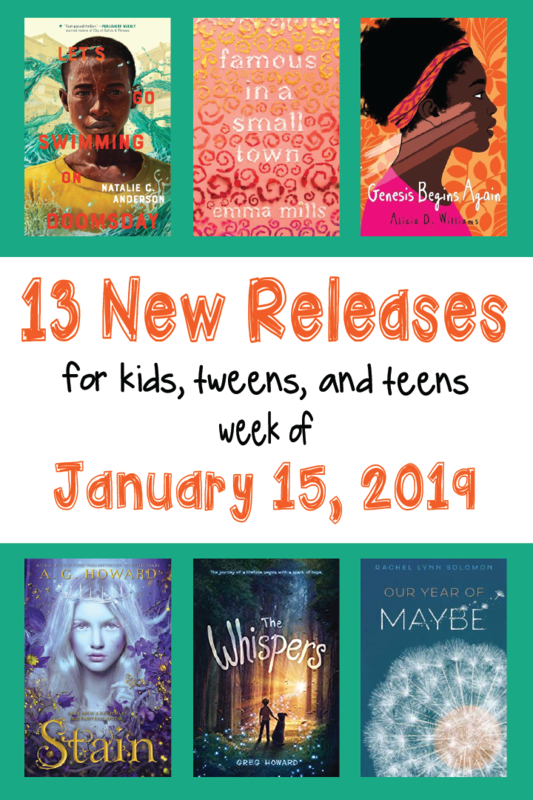 January seems to be such a good month for new releases! Would love to win one! Excited about a couple of the YA new releases, thanks for the heads up! I am so happy I found your page! Thank you for having such a spectacular, informative and fun page!